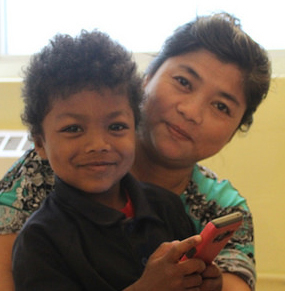 You can help create a pathway for immigrant and refugee families in Ithaca to go to school! Your Donations Directly Provide Access to Education for Refugee and Immigrant Families! Through the generous support of community members and friends, in our first year we were able to provide early childhood education to 24 children and access to adult English education for parents. Families who attended come from 13 countries including Afghanistan, Iraq, Saudi Arabia, Burma/Karen community, China, Ecuador, Indonesia, Japan, Taiwan, Korea, and Romania. We're moving into our second year of school and your support is needed to make this opportunity possible for additional families! 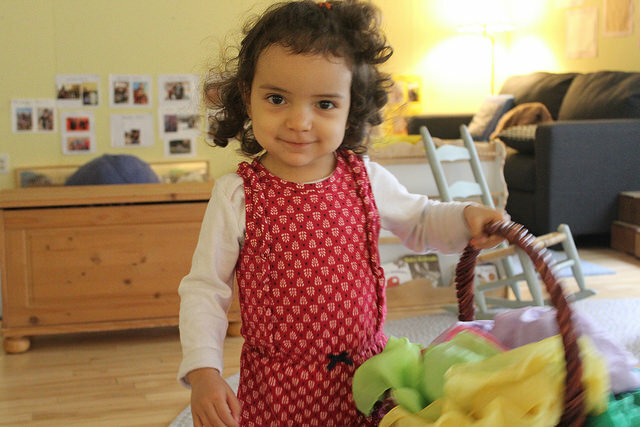 Ithaca Welcomes Refugees launched Global Roots Play School in 2017 in partnership with adult English as a Second Language (ESL) programs in Ithaca. Refugee and immigrant parents of children ages 18 months to 5 years old can send their child to Global Roots Play School and then walk a few blocks to their English classes at BOCES or English tutoring at Tompkins Learning Partners. Our unique two-generation focus means that we help both parents and young children have access to basic educational opportunities that should be open to everyone. Many immigrant and refugee families face barriers to accessing school for their children. 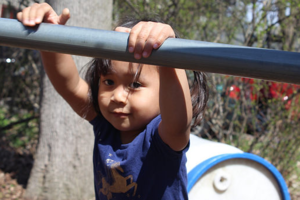 The high cost of early childhood education in downtown Ithaca, the cost and limitations of transportation, and limited English to navigate the community all add to the difficulty. Enrolled families are charged tuition on a sliding scale according to family income to ensure affordability. Your contribution will directly ensure that low-income families can afford to send their children to Global Roots Play School and attend adult English classes. To learn more, please read our FAQs and One Parent's Story below. GLOBAL ROOTS FAQs - Learn more! Why is Ithaca Welcomes Refugees focusing on EDUCATION? 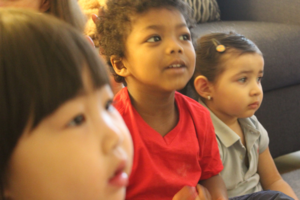 Research shows that quality early childhood education can provide critical benefits to children of immigrants and refugees including improved health and mental health, increased English language proficiency, and development of social and cognitive skills. Children benefit from the opportunity to grow in a high quality early childhood classroom where they are loved and nurtured as they grow. Our program supports each child’s development so that they will enter Pre-K and Kindergarten socially and emotionally ready to learn. Global Roots Play School is setting the foundation for lifelong learning for these new young Ithacans. Participation in ESL classes empowers parents to pursue their personal educational and career goals including reading, writing, and speaking English more fluently, passing the TASC (the new GED), and completing the U.S. citizenship exam. When refugee and immigrant parents become proficient in English they can become actively engaged members of their communities, contributing their many talents and skills that might otherwise have been underutilized due to a language barrier. In particular, women benefit from the freedom to pursue educational opportunities and advance their presence in society outside of the home. Global Roots Play School values the cultural and linguistic background of every family we serve and we practice anti-bias education. From the books to the toys in our classroom, we work hard to ensure that every child has a positive mirror to reflect their identity. 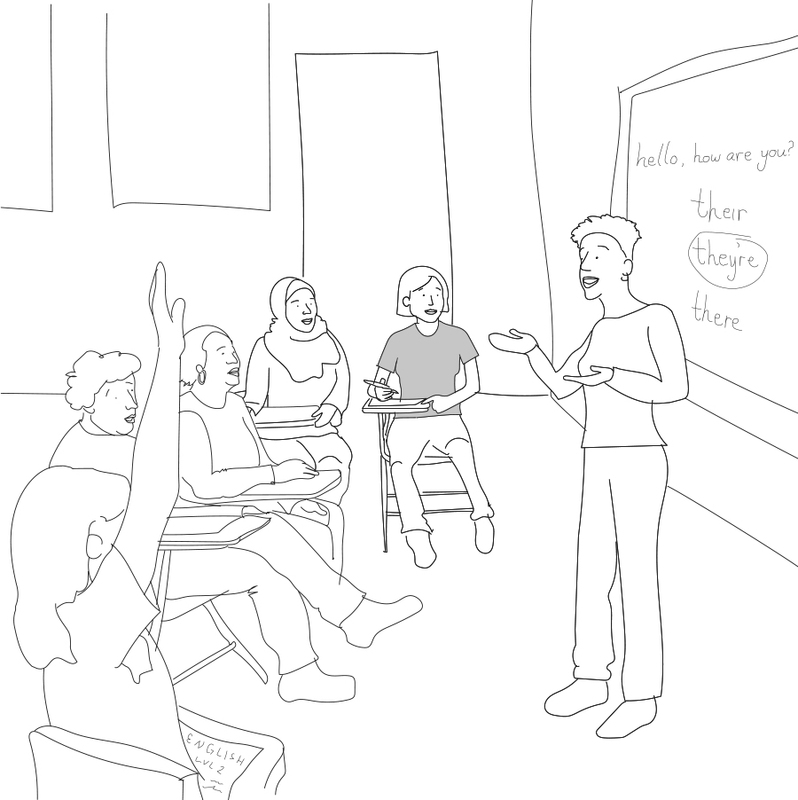 Why is there a partnership between Global Roots and Adult ESL programs? Some potential English as a Second Language students, most often mothers, are unable to attend classes or tutoring with BOCES or Tompkins Learning Partners because they are taking care of their young children during ESL class time. Global Roots Play School partners with Adult ESL programs so that we can mutually address the educational needs of both parents and young children and provide families with access to meaningful and life-changing educational opportunities. Global Roots Play School is located downtown just a short walk from BOCES and Tompkins Learning Partners. Knowing that their children are cared for in a high quality nursery school nearby, parents are free to focus on their own education. Through adult ESL education, parents increase their opportunities for employment and community involvement. Imagine being in a new country where you didn’t understand what people were saying. Learning English enables refugees and immigrants to participate in daily activities, access the support of the Ithaca community, have increased opportunities for employment, social interaction, and community integration. English language skills will also allow parents to communicate with their child’s teachers in the future and this will enormously impact their engagement with their child's education and strengthen the bridge between home and school. 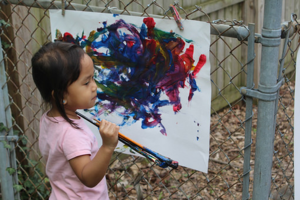 We choose play because it is how young children joyfully learn and make sense of their world. 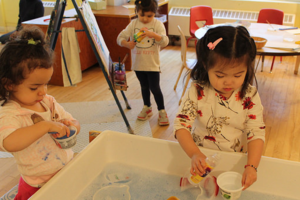 Developing language, forming peer relationships, expressing emotions, navigating conflicts, and developing sense of self and confidence all come about through play. 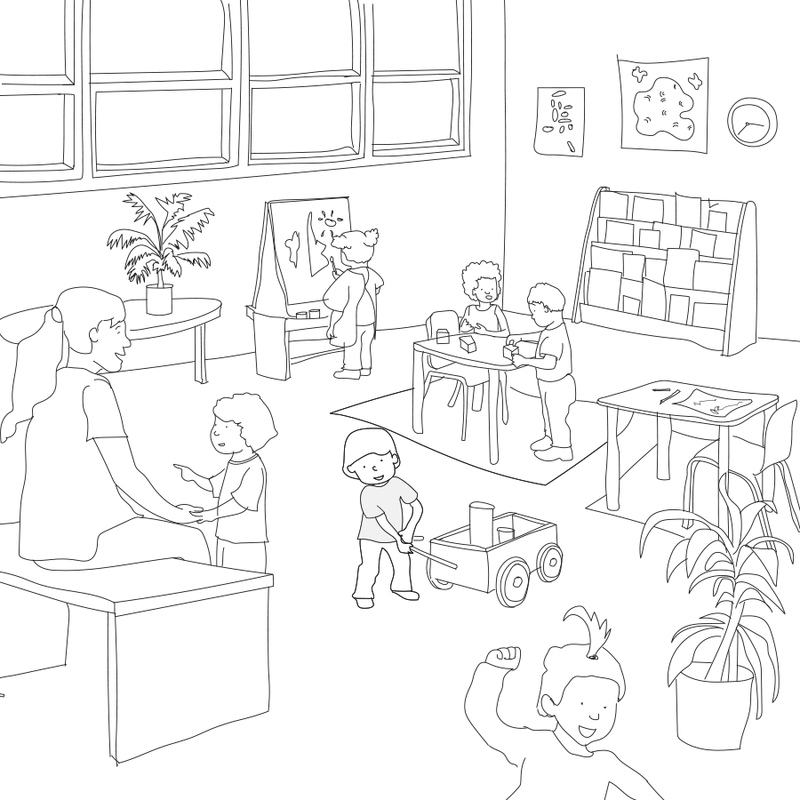 Children have the greatest opportunity to practice self-regulation and build executive functioning skills— two crucial school readiness skills— through open-ended play where they are given the chance to problem-solve, make decisions, and develop social connection. Our classroom is full of dual language learners so teachers talk, read, and sing throughout the day, as this is proven best practice for language development. Jing moved to the United States 6 years ago. When her first child Xenia was a little girl, they were living in Brooklyn. Jing knew about English as a Second Language (ESL) classes and she wanted to attend, but day care was too expensive so she had to stay at home and take care of Xenia. Jing and her daughter would spend the day playing at home with toys and watching television. It wasn't easy to meet other children for Xenia to play with. When Jing's family moved to Ithaca, things changed. She found out about Global Roots Play School, and her second daughter, two-year-old Kimberly, started attending in September 2017. Kimberly now has an opportunity that her older sister didn't get to have: the chance to learn new skills, develop her language, play and make friends at school, and get a break from screen time. Jing says that the Global Roots program's low cost helped her family so much— it is the reason that she is now able to attend English classes at BOCES downtown while Kimberley is cared for. Jing's husband works long hours in a Chinese restaurant, so he doesn't have the time to learn English. Jing has worked hard in ESL class and improved her English skills tremendously! Now, Jing is a mother who can communicate with her children's teachers, and participate more in her community through her English language skills. If you are interested in giving but do not wish to give by credit card online, you are welcome to send a check made out to "Global Roots Play School" to the address below. All checks which are received within the month of October will be added manually and appear in the GiveGab donation list. If you wish for your donation to remain anonymous, please send a note with the check. Thank you! Ithaca Welcomes Refugees (IWR) is a volunteer-led initiative, founded in December 2015, as a result of collective community reaction to the global refugee crisis. IWR works to foster a welcoming and fair environment for refugees and at-risk immigrants in our region. - Global Roots Play School - provides care 5 mornings per week to children ages 1.5 to 5, to enable parents to attend daytime English language classes. - The Welcome Home program (formerly Resettlement Support) - provides apartment set up and basic needs support including financial assistance for new refugee arrivals, emergency assistance, food support, and early orientation for newcomers. - Response Projects - provide groups of volunteers to offer longer term support for individuals/families through cultural and community orientation, interpretation support, accompaniment for appointments with community services, transportation, assistance with enrollment in community programs, and other specialized critical assistance identified through consultation with the individual/family. In addition, IWR provides education for the wider Ithaca community on refugee and immigrant issues, works with partner organizations to promote welcome, and trains its volunteers for active service in the community.